Sunday, instead of creating a new Sunday grilled cheese sandwich (sorry), I traveled to where the wonderful ingredient known as Goat Cheese is made: Mackenzie Creamery. 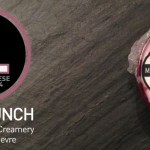 Recently, I have noticed Mackenzie Creamery Goat Cheese located within Mustard Seed Market and was intrigued. It definitely looked amazing but was somewhat pricey so unfortunately, I never purchased any. Then, I noticed in Cleveland Magazine that Mackenzie won in the category of 2009 Best of Cleveland: Food. That is when I knew I had to visit the creamery and actually try this cheese. How can I not support a local business, especially one that makes cheese?! 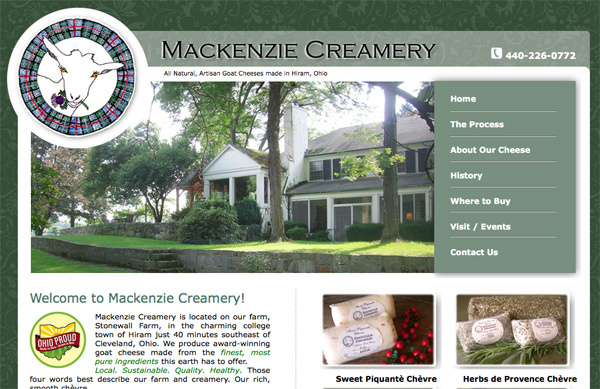 I simply emailed the Mackenzie Creamery, not knowing what to expect. After a few correspondences with Jean Mackenzie, founder/owner/chef/distributor/etc, she generously invited me (and my folks) to her house/creamery on a Sunday, the only time I could make it. I am very grateful that she was able to accommodate my schedule as she normally does not entertain on Sundays. Saturday was rainy, disgusting and cold. I only went outside because I had to. Sunday, on the other hand, was the exact opposite. The sun was shining and there was barely a cloud in the sky. It was the perfect day to take a ride out into the country, pick up some pumpkins and learn about goat cheese and the Mackenzie Creamery. The actual creamery building, shown in the main photo and above, was not there when the Mackenzie’s moved in just a few years ago. Mr. Jim Mackenzie, being the architect that he is, built the whole building. From scratch. Impressive, yes? I surely couldn’t do that. In that building is where the magic happens. Where the goat cheese is made. Since it was a Sunday, no cheese making was actually occurring, but we were able to see the room where the Goat Cheese is made. As you will read below, the Mackenzie’s do not have milking goats on their property. They are actually located on a local Amish farm where they milk them twice a day. Each day, a goat produces one gallon of milk. Now that is a lot of milk! If a goat is free range, the cheese made from it is absolutely horrendous and should not be eaten. However, if a goat is on a controlled diet of hay and grain, the cheese is much better and does not have that horrible smel. Keep in mind, there is a big difference between milking goats and meat goats. Their physical stature is completely different, especially in the case of their utters (extremely small vs. extremely large). Hanging in the photo above is the cheese itself. Instead of trying to explain exactly how goat cheese is actually made, I would get it completely wrong, I will let the Mackenzie Creamery web site explain it. (Photo is mine.) Keep in mind Jean told us that it takes 5-10 days to go from start to finish, which is a lot quicker than I imagined. Here at Mackenzie Creamery, we take pride in using the traditional methods of cheese making to create the freshest most smooth goat cheese you could ever imagine eating! We purchase our milk from a local goat dairy. We gently transport the milk in ten-gallon milk cans, driving very slowly so as not to churn or shake the milk. We pasteurize our fresh goat milk in the afternoon. We add culture and rennet at just the right temperature and the cheese curd begins to form. The pasteurizer is “put to bed” with the curds forming in a state of quiescence through the night. The next morning the curd is gently drained into hand sewn, drawstring cheese bags that Jean designed. The bags are hung over the drain table where the curds are allowed to separate from the whey overnight until they reach the perfect balance in texture and taste. We capture the whey in five-gallon buckets and give it to Dave Pallard, a local farmer who raises free-range hogs and chickens. Our chickens are lucky enough to get some of the fresh whey, too! The next day we lightly salt the curds. 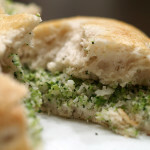 The cheese is then transformed into one of the several varieties that we make. By the end of the day, the cheese is vacuum sealed, labeled, boxed and put in the warehouse cooler for weekly deliveries to our local restaurants and retail stores. Then we hang up our white lab jackets and bandana “hats” and call it a day! Also in the works is an aging room, that of course Jim is building. 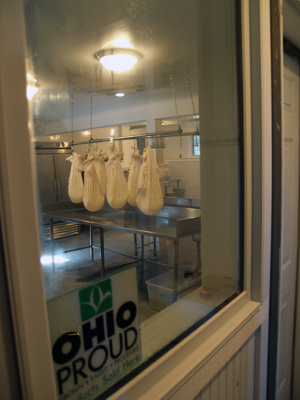 Created in this room will be aged Goat Cheese and/or some sort of cow’s milk cheese. I do not believe the decision has been completely made just yet. In the middle/left is a marsh, added by the Mackenzie’s, which helps make the farm environmentally friendly. The creamery is heated completely by this marsh and geothermal power (which I did my 8th grade science fair project on) and I believe that waste is returned back into the marsh, helping sustain plant life. The whey is taken away by another, local farmer, and it is fed to his livestock. The Mackenzie’s do have to live somewhere as well. They can’t live in the creamery. The above photo is the back of their home. Also located on the property were chickens that were very fun to watch. Unfortunately, these cute chickens will one day arrive on the Mackenzie’s dinner table, or at least someone’s table. Jean mentioned the types of chicken, they are all different, but I didn’t recognize any then and can’t remember them now. My apologies. As already stated, the Mackenzie’s do not have any milking goats on their property. At one point, prior to entering the cheese market, we believe they did but do not completely remember. Instead, they now have four pet goats that are named and will remain for as long as they live. I love staring at the picture above simply for the goat’s eyes. They are on the side of their head and in my opinion very weird, but I really like them. From the minute we arrived to the moment that we left, I realized that Jean Mackenzie is a special entrepreneur. Not only did she take us into her home/place of business on a Sunday afternoon, but she was also warm and welcoming. 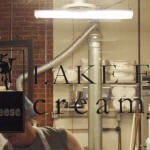 She wanted to talk about her creamery and we were there to listen and learn. Sure, I could have asked more questions, but maybe that will occur if I visit again. Mrs. Mackenzie even helped me clear up some confusion with my future life plans, giving me great advice as well as some people to contact. I don’t want to get too into it as I am only at the beginning and am not totally sure which path I will travel, but I believe she will be a great asset. My father asked a great question that came with a most unexpected, genuine answer. He asked of Jean, “What makes your cheese so good/better than anyone else?” Her answer, stated in a very authentic manner, was, “Passion.” That right there tells you everything you need to know about Jean Mackenzie and the Mackenzie Creamery located in Hiram, OH. Editor’s Note: I did purchase some Plain Chèvre as well as some Garlic Chive Chèvre. I briefly tried the Plain Chèvre and it was very delicious. 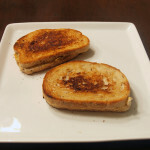 I hope to taste it again as well as make a grilled cheese featuring. Look for that very soon! 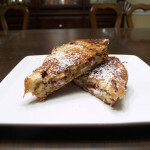 Posted in Grilled Cheese and tagged creamery, goat cheese, mackenzie creamery. What a great visit you had. The setting looks magnificent and Jean MacKenzie sounds like a most generous and inspiring lady. Very special indeed.